Jonathan Foster-Pedley is a leader in South Africa regarding executive development and strategy and creativity education. As the founding director and designer of the GSBâ€™s Executive MBA programme, he led the introduction of new learning methods that integrated systems thinking, rigorous action learning, personal leadership branding, and reflective educational practice that have helped put the MBA in the top 50 globally.
. I am in awe of this man! He is dynamic, creative, engaging and has insights that rock people's worlds and shift their businesses. He's also lecturing on the Nomadic Marketing programme, because he "gets" (deeply) how web2.0 is changing business strategy forever. 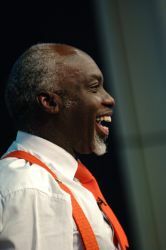 Professor Eddie Obeng is the founder of Pentacle Business School. He has been described variously by the Financial Times as an â€˜Agent provocateurâ€™ and a â€˜...leading revolutionaryâ€™. The Daily Telegraph described him as the â€˜Max Headroomâ€™ of the business school world and â€˜unusual to back his ideas with his own money...â€™ adding that he has a â€˜backlist of book titles in a style far removed from the ponderous approach of most management tomes.â€™ He has been called the "Eclectic Guru" by Business Life. Venue is the Primi Piatti Studio at the Zone, Rosebank, Jozi. Once again - put your name here to come. The vibe will be informal with talks by the two men , and maybe one by Mike Stopforth too, and as always, a great opportunity to meet and connect with cool people who are also interested in business innovation.